Form this tutorial onwards we are going to extend our project setup step by step. Today we are looking how to install additional plugins and features to our setup. For a list of all Oomph related tutorials see my Oomph Tutorials Overview. 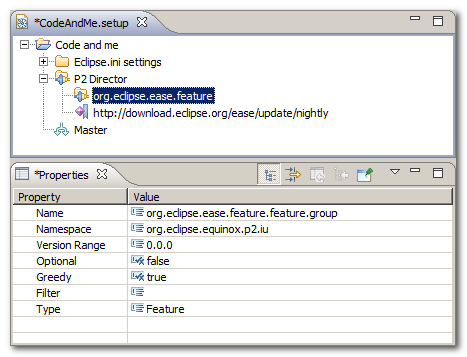 Open your Oomph setup file and create a new task of type P2 Director. To install components we need to provide a p2 site location and components from that location to install. So create a new Repository child to our task. 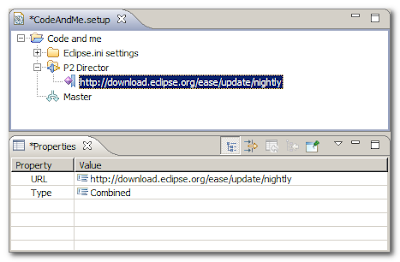 When selected the Properties view will ask for a URL. Point to the p2 location you want to install stuff from. Leave Type to Combined. If you do not know about repository types you definitely do not need to change this setting. When you are working with a p2 site provided by eclipse, Oomph can help to identify update site locations. Once you added the repository you can start to add features to be installed from that site. The manual way requires you to create a new child node of type Requirement. Go to its Properties and set Name to the feature id you want to install. You may add version ranges or make installs optional (which means do not throw an error when the feature cannot be installed). 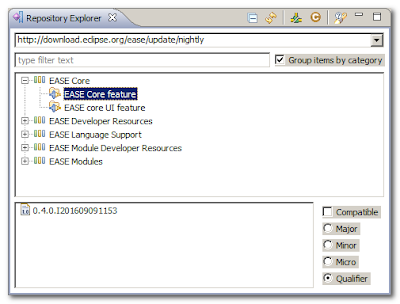 Right click on your Repository node and select Explore. The Repository Explorer view comes up and displays features the same way as you might know it from the eclipse p2 installer. Now you can drag and drop entries to your P2 Director task.